What 10 lightweight breakthroughs really made a difference? Lightweight is a state of mind, rather than a description of individual pieces of kit. Going lightweight is about taking less than you are mentally comfortable with and is about attitude and commitment to a physical challenge –whether polar exploration, cycling, mountaineering, backpacking or adventure racing. It is a philosophy as much as a technique and it is not new. Here are the 10 Lightweight Breakthroughs we identified for TRAIL in 2003. The rubberized silk jacket was made in mid 19th century, using processes developed by Macintosh. It weighed 5.25ozs and was small and light enough to fit in a cigar case. The Macintosh rubber coating processes, established Manchester as the world centre for waterproof jackets by the 1890’s. Before the First World War silk was widely used for everything from ropes to tents. Nansen was the lightweight pioneer and on his Farthest North expedition, 1893-96, silk was used for his single pole pyramid tent. 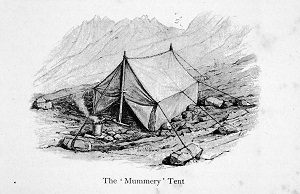 This started a trend and Fred Mummery’s silk mountain tent weighed 3.5lbs and substituted ice axes for poles – an inconvenient weight saving technique. Thomas Hiram Holding, founder of the Cycle Touring Club and the pioneer of cycle camping, designed a legendary outfit in 1899. 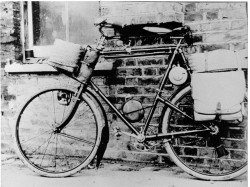 His ‘Phantom’ Kit included a 13 oz silk tent, 15 oz bamboo poles, a down quilt weighing 1 lb 8 oz with total personal kit, included his special ‘clip onto bike frame baby primus’ weighing 6 pounds including food. Kirkpatrick and Hope climbed in the Alps without guides before the First World War and used packs of Burberry gabardine weighing just 6 ½ ounces. They weighed their kit meticulously and clothing consisted of light Shetland wool and silk. For the hut walk they carried just 9lbs and for the summit day only 61/2 lbs. 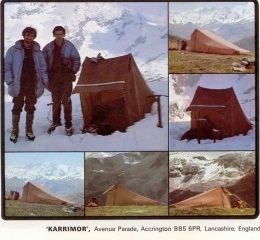 The piece of lightweight gear which became the symbol of outdoor activity in the 1970s was the Karrimat. These closed cell foam mats were developed by were developed by Karrimor from 1967 and replaced heavy and unreliable rubber coated inflatable air beds. Karrimats also brought insulation as well being light, lighter. They even featured on a postage stamp to celebrate the Duke of Edinburgh award. 6 In 1972 Ken Ledward produced two full sets of gear for himself and Karrimor MD Mike Parsons for the Karrimor International Mountain Marathon. Mike’s weighed just 6 ½ lbs and Ken’s was just 5 ½ lbs. The wedge shaped Marathon tent weighed just 2lbs inclusive and the pack less that 100gm. 7 The launch of the KS-B –another Ledward –Parsons collaboration- in 1981 changed all mountain footwear. It is remembered as the first fabric boot, but it was the first lightweight boot and had a sole that did not to ape the nailing patterns and the mid-sole design revolutionised all other boots. 8 Mountain clothing changed from the mid 1980s. Gone were the heavy woollen shirts and baggy tweed breeches to be replaced by fleece, Pertex and micro fibres. Pertex – the almost micro fibre – was developed from typewriter ribbon technology to make lightweight wind shells, improving on Mallory’s silk layers. 9 Pile was invented in the 1940’s as literally imitation fur but there were few users initially. In 1961, Helly Hansen pioneered the fibre pile pullover for North Atlantic fishermen, as a replacement for Norwegian oiled wool sweaters. This resulted in improvements in warmth/weight ratio over wool These became normal climbing wear through the 60s and 70s, but they looked awful. Many companies produced pile garments, especially in UK, including Javelin and North Cape, but they did not survive when the dramatic shift to fleece occurred.This resulted in improvements in warmth/weight ratio over wool but it looked awful. In came fleece in 1984 by Patagonia, followed by their supplier Malden who marketed Polartec in 1986. 10. In 1995 Ray and Jenny Jardine hiked the Pacific Crest Trail in a record three months and four days. The packs weighed an average of 8.5 pounds, including clothing but excluding food of course. The pack itself weighed 430 gm but most important was the total commitment approach which mirrored many of the early pioneers..
Pile was much earlier than 1979, I had a much cherished Helly Hansen jacket in 1978, and It was very well established by that time. Checking on their website gives a date of 1961. You are quite right Rob and thanks for much for picking up the error, all corrected now, not sure where the gremlin came from as had correct on our timeline and elsewhere. I suspect some bad copying and pasting, which I should have picked up when I put the post up. Anyway all correct now and slightly expanded.